But we can help them put their lives back together. We won’t save everyone. But that doesn’t mean that we shouldn’t try. One year ago, Kelsey Williams opened up a brand-new legal clinic in Los Angeles. Working closely with O’Melveny & Myers LLP and Manatt, Phelps & Phillips, LLP, as well as a group of dedicated legal services nonprofits, she launched the “IMPACT LA” project to offer a free, monthly legal clinic for domestic violence survivors, held at the Jenessee Center (a domestic violence intervention nonprofit) and staffed 100% by pro bono volunteers. October is Domestic Violence Awareness month, and so we asked Kelsey to share her experience starting and running this new project that provides free assistance to survivors facing pressing legal problems relating to immigration, public benefits, and housing. I was more than a little scared to run the IMPACT LA project. “Terrified” might be a better word. Developing any new program is intimidating, but the domestic violence focus raised the stakes even higher. I worried I wouldn’t do it justice. The learning curve was steep; I wanted the first clinic to be perfect, a seamless experience for our survivors and volunteers. I had to learn quickly and lean on our amazing partner, Jenesse Center. In the first year of my fellowship, I’ve learned a lot of lessons: to be constantly improving is better than being perfect, and that each day brings another lesson to be learned. One day can be heartbreaking and the next, life affirming. Some lessons come easy –you can never have too many notepads; others, definitely less so– a project like IMPACT LA does not and should not get easier. The first lesson came not in the office or at the clinic but outside of work. It’s the part of my job I was least prepared for, equivocally. It was the stories. Lesson one: make no assumptions. And in the beginning, they were always right. I never would have suspected them to be a survivor of domestic violence. While there is no one type of survivor, I simply didn’t realize just how many people in my personal, professional, and daily life had been impacted by violence in the home. Of course, just based on the number s, it’s inevitable that I know someone who has been personally impacted by domestic violence. But statistics are hard to translate into the faces of the people you see everyday. You know them too. Maybe they haven’t shared with you, but they are there. Learning that domestic violence lives among all of us made it more difficult to learn the next lesson. Lesson two: if you do this work, you won’t save everyone. I can’t, you can’t, but that doesn’t mean we should not try. The men and women we work with feel the impact of domestic violence long after any physical assault ends. They come to IMPACT LA because they are living with the consequences of abuse. We worked this year with a woman who left a violent situation more than five years ago who is still untangling legal repercussions and working every day to get things back on track. To restore the future her family should have had until abuse entered their lives. We can’t go back and prevent what happened to her family. But we can try to help her now. The majority of individuals come in to untangle the legal repercussions of the abuse they have endured. Removed from the violence they are able to regain control of their lives with the help of our volunteers and partners. But, sometimes it’s not enough. I know now that I can’t save everyone. What I can do is carry the memory of their stories and experiences with me. I hold them in my heart as a reminder and a guide for the hard days. The more I learn about the reality and prevalence of domestic violence, the more optimistic I become. Our world need not be full of future victims and survivors of domestic violence. IMPACT LA and great projects like Jenesse’s Youth Conversations are trying to bring an end to domestic abuse through education and awareness. 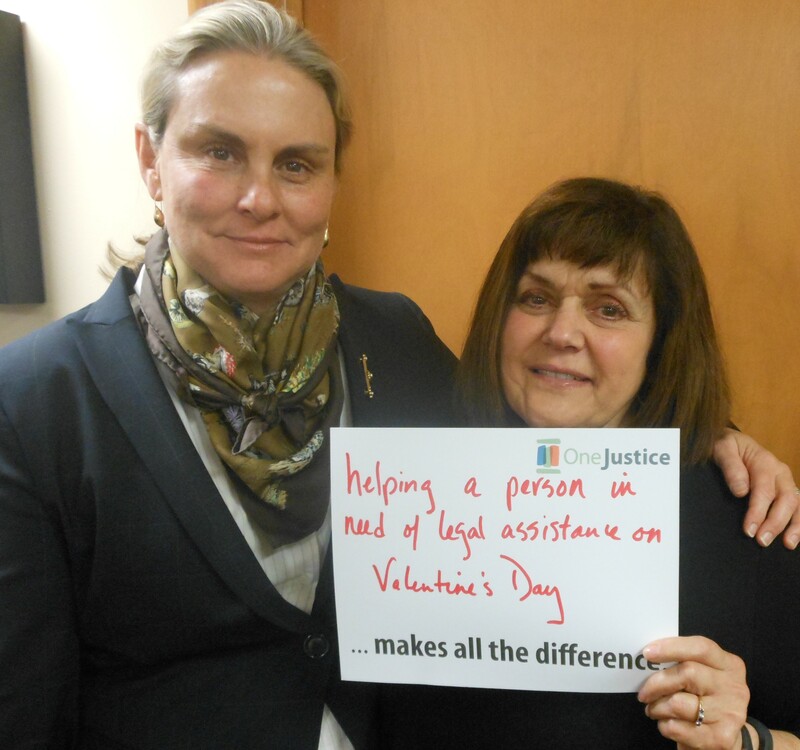 Two IMPACT LA volunteers who staffed the free clinic at the Jenesse Center on Valentine’s Day 2014. I’m so grateful to all of these survivors who have opened their hearts to me and the strong individuals working with me to end domestic violence. The work that we do with the Jenesse Center at IMPACT LA is important. And we couldn’t do it without our supporters, volunteers, partners, and brave survivors. Working together, we can save and rebuild lives. If you or someone you know needs help – please reach out. You can contact the National Domestic Violence Hotline at 1-800-799-7233. Our most heartfelt gratitude to the amazing staff at the Jenessee Center, our legal services partners, Bet Tzedek Legal Services, Central American Resource Center, Inner City Law Center, Legal Aid Foundation of Los Angeles, Levitt & Quinn Family Law Center, Neighborhood Legal Services of Los Angeles County, and Public Counsel Law Center, and all the dedicated volunteers from, Gibson, Dunn & Crutcher LLP, Jones Day, Kilpatrick Townsend & Stockton LLP, Latham & Watkins LLP, Manatt, Phelps & Phillips LLP, Morgan, Lewis & Bockius LLP, Morrison & Foerster LLP, Nixon Peabody LLP, O’Melveny & Myers LLP, Orrick, Herrington & Sutcliffe LLP, Simpson Thacher & Bartlett LLP, Toyota Motor Sales, U.S.A., Inc., White & Case LLP, and Winston & Strawn LLP. IMPACT LA is part of the national IMPACT (Involving More Pro bono Attorneys in our Community Together) project of the Association of Pro Bono Counsel (APBCo), which is a series of new collaborations across the country to expand national law firm efforts to increase access to justice. OneJustice is honored and thrilled to be working together with APBCo on the IMPACT LA Project. What’s a Leslie Knope-type to do after law school graduation? For me, as my 3L year at Loyola Law School began, I was hoping to land a fellowship and start a public interest career in Los Angeles. Luckily for me, some wonderful people over at the Association of Pro Bono Counsel were looking for someone to work on a brand-new project working with domestic violence survivors in Los Angeles at the same time. Through fate, and a dash of speedy emailing, I was able to get an interview for this new position, armed with little more information than I’ve spelled out here. And I think they mentioned something about Joe Biden. After a few hours of incessant email refreshing; a quick application period; and a bit more waiting, I found out I’d received a Loyola Fellowship to coordinate the Los Angeles Project of a nationwide program, IMPACT. 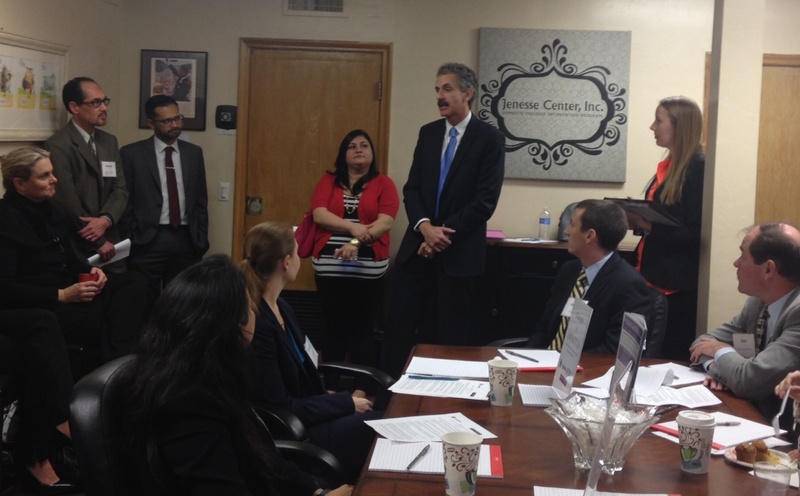 LA City Attorney Mike Feuer opens yesterday’s IMPACT LA launch clinic. From there, it was a whirlwind of bar studies and life changes. A few months later, I found myself in the Los Angeles office of OneJustice, hoping I was the only one who thought I had no idea what I was doing. My friends all gave me time-tested 20-something advice, “fake it ’til you make it.” After just a few months of working with the fabulous OneJustice team and the great folks from APBCo, I know I’m incredibly lucky to be here and that I have a remarkable opportunity to make a real difference in people’s lives. My role as the Loyola Law School Post Graduate Public Interest Law Fellow is to coordinate the IMPACT LA Project. IMPACT is a nationwide project that was formed in response to a meeting between ABPCo members and Vice President Joe Biden. The APBCo IMPACT (“Involving More Pro Bono Attorneys in Our Communities Together”) Project is taking root in eight urban centers, including Los Angeles and the San Francisco Bay Area. The objective of the IMPACT Project is to design innovative and sustainable new solutions that will increase access to free legal services by utilizing pro bono volunteers. Here in LA, our project is a monthly clinic that provides free wrap-around legal services to survivors of domestic violence in South LA at the Jenesse Center, a leading domestic violence shelter and support center. At the clinics, volunteer attorneys from Los Angeles APBCo-member law firms provide free legal assistance in the areas of housing, immigration, and public benefits. And just yesterday, with the help of the LA City Attorney, Mike Feuer, we kicked off 2014 decisively. Volunteer attorneys from Latham & Watkins and Morrison & Foerster staffed the IMPACT LA launch clinic yesterday working with supervising attorneys from Public Counsel and Neighborhood Legal Services of Los Angeles County. 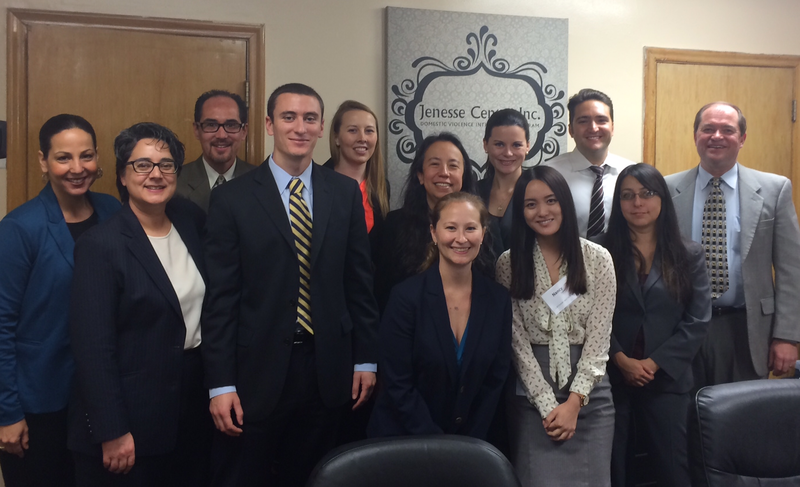 At our official IMPACT LA launch clinic yesterday, eight volunteer attorneys from Morrison & Foerster and Latham & Watkins gathered at the Jenesse Center to give generously of their time and energy. During the clinic, the volunteers met with and advised six women, working closely with two supervising legal services attorneys from Neighborhood Legal Services of Los Angeles County and Public Counsel. And this was just the beginning. We will now be running monthly clinics at the Jenesse Center, staffed by a rotation of pro bono attorneys from law firms and supervised by a partnership of local legal services nonprofits. For me, the most impressive thing about last Friday’s clinic was the outpouring of support from volunteers for survivors of domestic violence. It’s an issue that can be difficult to talk about for many. However, my experience with the clinic has been that all of our volunteers are compassionate people who enjoy the opportunity to provide these services to women in the city that we all share. And most importantly, the women who receive the services are able to better understand their situations and take control of their own lives. And that is what makes my job so worthwhile. Well, that and being able to imagine that somewhere out there, Vice President Biden is proud of me. Kelsey Williams is a Loyola Law School Post-Graduate Public Interest Law Fellow at OneJustice and runs IMPACT LA in Southern California. 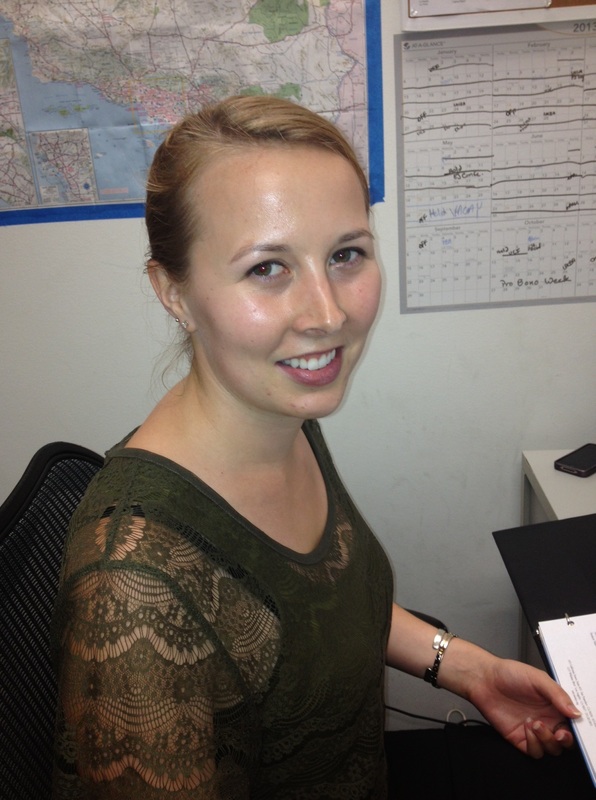 During law school, Kelsey spent one summer working in the Students’ Rights Project at the ACLU of Southern California and her second summer working with foster youth at Public Counsel. Kelsey is loving running IMPACT LA, learning more about the needs of domestic violence survivors, and devising ways for IMPACT LA to meet them. If your law firm or corporate legal department is interested in volunteering for an IMPACT LA clinic, please email Kelsey at kwilliams@one-justice.org.